New to the Atlanta Beltline! 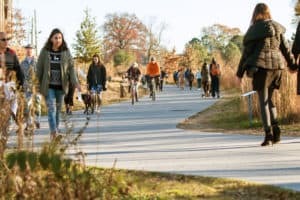 The Beltline is no secret to Atlantians, but there are some new and exciting things happening on the Beltline that will be worth checking out this Spring and Summer! And with the City of Atlanta recently purchasing the railroad corridor that will close the Southside “loop” expect more changes throughout the next year! New Realm – On the Eastside Trail, New Realm features several seating areas that include a rooftop patio, an outdoor beer garden (on the beltline! ), a main dining room, a lower level patio and a private dining space for special events! In addition to their own beer that is brewed on site, this new hot spot boasts tasty food options like ground prime beef burgers and wood-fired pizzas. Batter Cookie Dough Counter – This fun new treat is in Ponce City Market! Edible cookie dough served up like ice cream. With 9 great flavors (including vegan and gluten free options!) and fresh baked cookies, what’s not to love!? Stop by and reminisce about when you’d lick the spoon while your mom baked cookies! Recess – Located in Krog Street Market, this new food stall is brought to us by the Castellucci Hospitality Group (think Bar Mercado, Cook & Soliders, and Iberian Pig) This vegetable centric spot will feature grain bowls, salads, sandwiches, and a small list of cocktails and beer. This one is certainly on my list! Guac Y Margys – This new Mexican hot spot will be on the Eastside trail just up from Krog Street Market. It has dubbed itself “Atlanta’s Margarita Bar”. I’m all about some Mexican food, so I’ll definitely be checking this out once it opens early this summer. Nina and Rafi – This new restaurant will come to us from the owners of O4W Pizza and Cypress Street Pint and Plate. It’s planning on featuring O4W pizzas and other Italian sandwiches, salads, and pasts (including vegan and gluten-free options!). This plate is sure to be good, so you’ll be able to find me there mid-summer! Wild Heaven Beer – With their first location in Decatur, Wild Heaven Beer will be opening its “primary production and tasting facility” in the Lee + White Building on the Westisde trail (joining its neighbors ASW Distillery and Monday Night Brewery) It will be a beer production facility and tasting room that will be opening in the fourth quarter of this year. When you finally decide to make the Beltline your backyard, give The Peters Company a call! We’ll help you find the perfect spot!